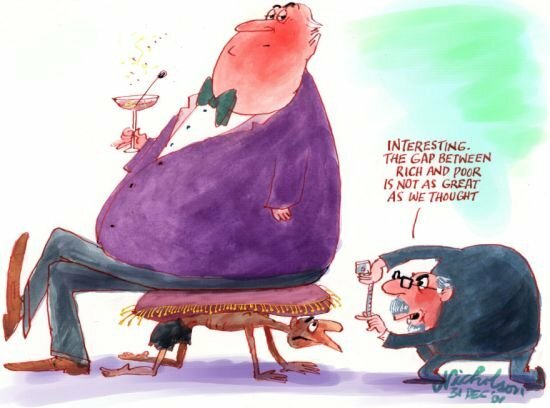 It appears the gap between the rich and the poor is expanding every second. Some people seem to think that by giving corporations tax breaks the extra money corporations are saving will trickle down through the ranks and the people at the bottom of the ladder will be the recipients. On the other hand, some people think that in giving these corporations tax breaks, they are putting more money into the pockets of those at the top of the ladder. I for one, agree with the second school of thought. It seems as though this might be helping to increase the gap between the rich and the poor. I doesn’t seem to make sense to give more money to the rich in an effort to stimulate the economy. Those are the people that already have money and won’t necessarily spend any additional money. Putting money into the hands of the middle class seems like it would be spent. This is a social class that is struggling to make ends meet and if they had the extra money, they would spend it in turn, stimulating the economy. Barack Obama has a tax plan to give all of those in the middle class a $1000 tax break. By my theory, this plan to stimulate the economy from the bottom up will be far more effective than giving those tax breaks to the top in hopes of it trickling down.